1. What are your thoughts on the following statement from p.140? But instead of living this way, we’ve created a whole brand of churches that do not depend on the Spirit a whole culture of Christians who are not disciples, a new group of “followers” who do not follow. 2. When was the last time you were in “awe of God”? 3. What would it look like if our churches functioned like Acts 2:42-47? What does it look like to live with the Holy Spirit’s power? The greatest example of the Holy Spirit’s power is through the life of Jesus. While on this earth, Jesus was fully human and was empowered by the Spirit in all He did. 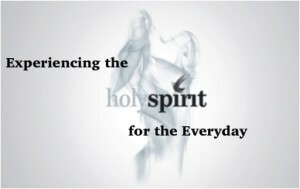 Here’s session 5 of Experiencing the Holy Spirit in the Everyday. If you have some time, check out he teaching video below.